Researchers at the VA Boston Healthcare System are testing the effects of light therapy on brain function in the Veterans with Gulf War Illness study. The therapy, though still considered “investigational” and not covered by most health insurance plans, is already used by some alternative medicine practitioners to treat wounds and pain. The light from the diodes has been shown to boost the output of nitric oxide near where the LEDs are placed, which improves blood flow in that location. Naeser is a research linguist and speech pathologist for the Boston VA, and a research professor of neurology at Boston University School of Medicine (BUSM). The LED therapy increases blood flow in the brain, as shown on MRI scans. It also appears to have an effect on damaged brain cells, specifically on their mitochondria. These are bean-shaped subunits within the cell that put out energy in the form of a chemical known as ATP. The red (600 nm) and NIR (800–900nm) wavelengths penetrate through the scalp and skull by about 1 cm to reach brain cells and spur the mitochondria to produce more ATP. That can mean clearer, sharper thinking, says Naeser. Nitric oxide is also released and diffused outside the cell wall, promoting local vasodilation and increased blood flow. Naeser says brain damage caused by explosions, or exposure to pesticides or other neurotoxins — such as in the Gulf War — could impair the mitochondria in cells. She believes light therapy can be a valuable adjunct to standard cognitive rehabilitation, which typically involves “exercising” the brain in various ways to take advantage of brain plasticity and forge new neural networks. The LED approach has its skeptics, but Naeser’s group has already published some encouraging results in the peer-reviewed scientific literature. Last June in the Journal of Neurotrauma, they reported in an open-access paper, the outcomes of LED therapy in 11 patients with chronic TBI, ranging in age from 26 to 62. Most of the injuries occurred in car accidents or on the athletic field. One was a battlefield injury, from an improvised explosive device (IED). The study authors concluded that the pilot results warranted a randomized, placebo-controlled trial — the gold standard in medical research. That’s happening now, thanks to VA support. One trial, already underway, aims to enroll 160 Gulf War veterans. Half the veterans will get the real LED therapy for 15 sessions, while the others will get a mock version, using sham lights. Then the groups will switch, so all the volunteers will end up getting the real therapy, although they won’t know at which point they received it. After each Veteran’s last real or sham treatment, he or she will undergo tests of brain function. 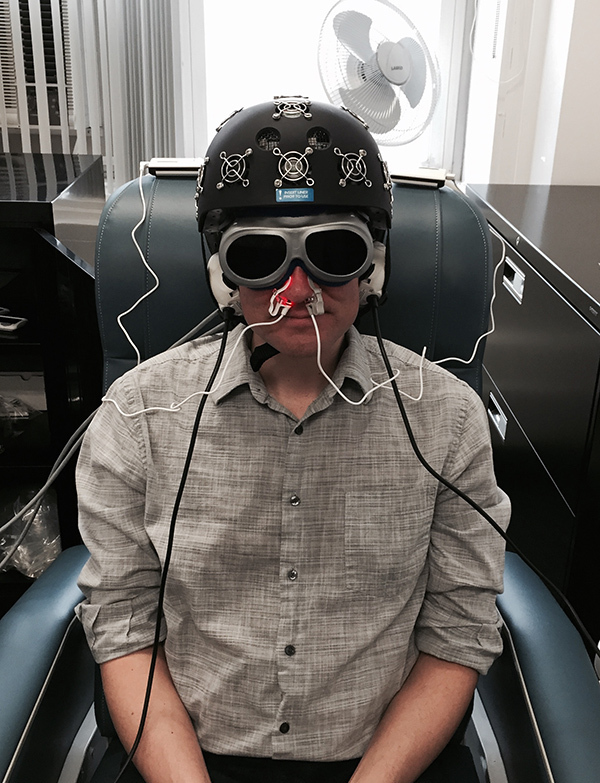 Naeser points out that “because this is a blinded, controlled study, neither the participant nor the assistant applying the LED helmet and the intranasal diodes is aware whether the LEDs are real or sham — they both wear goggles that block out the red LED light.” The near-infrared light is invisible. Later this year, a trial will launch for Veterans age 18 to 55 who have both traumatic brain injury (TBI) and post-traumatic stress disorder, a common combination in recent war Veterans. The VA-funded study will be led by Naeser’s colleague Dr. Jeffrey Knight, a psychologist with VA’s National Center for PTSD and an assistant professor of psychiatry at BUSM. Naeser is collaborating on an Army study testing LED therapy, delivered via the helmets and the nose diodes, for active-duty soldiers with blast TBI. The study, funded by the Army’s Advanced Medical Technology Initiative, will also test the feasibility and effectiveness of using only the nasal LED devices — and not the helmets — as an at-home, self-administered treatment. The study leader is Dr. Carole Palumbo, an investigator with VA and the Army Research Institute of Environmental Medicine, and an associate professor of neurology at BUSM. Naeser hopes the work will validate LED therapy as a viable treatment for veterans and others with brain difficulties. She also foresees potential for conditions such as depression, stroke, dementia, and even autism. According to sources cited by the authors, i is estimated that there are 5,300,000 Americans living with TBI-related disabilities. The annual economic cost is estimated to be between $60 and $76.5 billion. It is estimated that 15–40% of soldiers returning from Iraq and Afghanistan as part of Operation Enduring Freedom/Operation Iraqi Freedom (OEF/OIF) report at least one TBI. And within the past 10 years, the diagnosis of concussion in high school sports has increased annually by 16.5%. The research was supported by U.S. Department of Veterans Affairs. National Institutes of Health, American Medical Society for Sports Medicine, and American College of Sports Medicine-American Medical Society for Sports Medicine Foundation. Kathy Beitz, 29, is legally blind - she lost her vision as a child and, for a long time, adapted to living in a world she couldn't see (Kathy has Stargardt disease, a condition that causes macular degeneration). Technology called eSight glasses allowed Kathy to see her son on the day he was born. The glasses cost $15,000 and work by capturing real-time video and enhancing it. A new Northwestern Medicine study reports stimulating a particular region in the brain via non-invasive delivery of electrical current using magnetic pulses, called Transcranial Magnetic Stimulation, improves memory. “The vOICe” is a visual-to-auditory sensory substitution device that encodes images taken by a camera worn by the user into “soundscapes” from which experienced users can extract information about their surroundings. 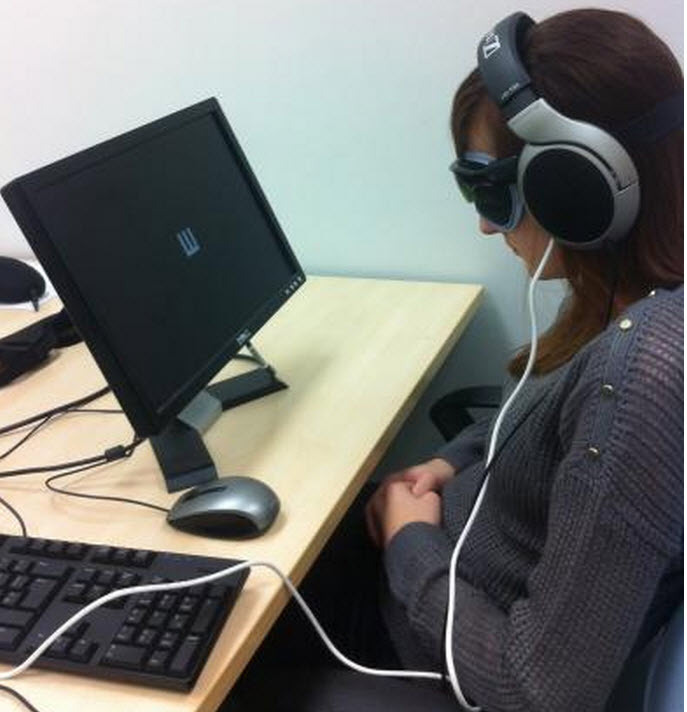 It helps blind people use sounds to build an image in their minds of the things around them. A research team, led by Dr Michael Proulx, from the University’s Department of Psychology, looked at how blindfolded sighted participants would do on an eye test using the device. Abstract. The term "cognitive enhancement" usually characterizes interventions in humans that aim to improve mental functioning beyond what is necessary to sustain or restore good health. While the current bioethical debate mainly concentrates on pharmaceuticals, according to the given characterization, cognitive enhancement also by non-pharmacological means has to be regarded as enhancement proper. Here we summarize empirical data on approaches using nutrition, physical exercise, sleep, meditation, mnemonic strategies, computer training, and brain stimulation for enhancing cognitive capabilities. Several of these non-pharmacological enhancement strategies seem to be more efficacious compared to currently available pharmaceuticals usually coined as cognitive enhancers. While many ethical arguments of the cognitive enhancement debate apply to both pharmacological and non-pharmacological enhancers, some of them appear in new light when considered on the background of non-pharmacological enhancement. Sports athletes in recent years have concentrated on making themselves stronger and faster (sometimes to their own detriment and sanctity of the sport — see Baseball, Steroids Era), but building muscle mass is only part of the equation. Nike, one of the biggest sponsors of sport, sees potential (and profit) in specialized eye gear designed to allow athletes to fine tune their sensory skills and “see their sport better” through the use of modern technology. To prove its point and draw attention to its Sparq Vapor Strobe sports glasses, Nike commissioned a study at Duke’s Institute for Brain Sciences that focuses on “stroboscopic training” using Nike’s eyewear. In essence, Nike went in search of scientific data to prove that simulating a strobe-like experience can increase visual short-term memory retention, and purportedly found it. 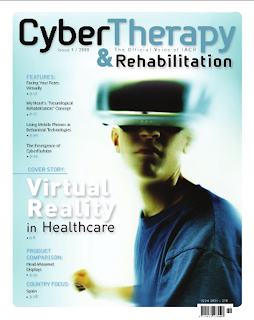 The new issue of Cybertherapy and Rehabilitation magazine (3/2) is now online and available for full-text download. 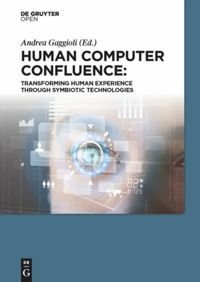 Topics covered by this issue include brain-computer interface, cognitive enhancement and trainers and the use of massive multiplayer online games in rehabilitation and therapy. The XWave is a new technology that uses a single electrode placed on the wearer’s forehead to measure electroencephalography (EEG) data, and converts these analog signals into digital so they can be used to control an external device. The XWave comes bundled with a software that includes a number of brain-training exercises. These include levitating a ball on the iDevice’s screen, changing a color based on the relaxation level of your brain and training your brain to maximize its attention span. XWave, powered by NeuroSky eSense patented technologies, senses the faintest electrical impulses transmitted through your skull to the surface of your forehead and converts these analogue signals into digital. With XWave, you will be able to detect attention and meditation levels, as well as train your mind to control things. Objects in a game can be controlled, lights in your living room can change colour depending on your mood; the possibilities are limited to only the power of your imagination. The interesting feature is that the company is even serving up their APIs so developers can design and develop apps using the XWave device. The company reports that some apps already in development include games in which objects are controlled by the wearer’s mind and another that allows the wearer to control the lights in their home or select music based on their mood. You can order an XWave for $US100; it ships on November 1. LevelHead, an augmented-reality spatial-memory game by Julian Oliver. This short movie, entitled The Future of Augmented Cognition, depicts DARPA’s vision of how augmented cognition will in the future be used to integrate multiple sources of information. The film is set in the year 2030, and takes place in a command centre which monitors cyberspace activity for threats to the global economy. The movie was commissioned by DARPA and directed by Alexander Singer. Now that neuroscientists have identified the brain's synchronizing mechanism, they've started work on therapies to strengthen attention. Ultimately, it may be possible to improve your attention by using pulses of light to directly synchronize your neurons, a form of direct therapy that could help people with schizophrenia and attention-deficit problems, said Dr. Desimone, the director of the McGovern Institute for Brain Research at MIT. In the nearer future, neuroscientists might also help you focus by observing your brain activity and providing biofeedback as you practice strengthening your concentration. Researchers have already observed higher levels of synchrony in the brains of people who regularly meditate. The sensitivity of a virtual reality task to planning and prospective memory impairments: Group differences and the efficacy of periodic alerts on performance. Executive functions have been argued to be the most vulnerable to brain injury. In providing an analogue of everyday situations amenable to control and management virtual reality (VR) may offer better insights into planning deficits consequent upon brain injury. Here 17 participants with a non-progressive brain injury and reported executive difficulties in everyday life were asked to perform a VR task (working in a furniture storage unit) that emphasised planning, rule following and prospective memory tasks. When compared with an age and IQ-matched control group, the patients were significantly poorer in terms of their strategy, their time-based prospective memory, the overall time required and their propensity to break rules. An examination of sensitivity and specificity of the VR task to group membership (brain-injured or control) showed that, with specificity set at maximum, sensitivity was only modest (at just over 50%). A second component to the study investigated whether the patients' performance could be improved by periodic auditory alerts. Previous studies have demonstrated that such cues can improve performance on laboratory tests, executive tests and everyday prospective memory tasks. Here, no significant changes in performance were detected. Potential reasons for this finding are discussed, including symptom severity and differences in the tasks employed in previous studies. Auditory and Spatial Navigation Imagery in Brain-Computer Interface using Optimized Wavelets. Features extracted with optimized wavelets were compared with standard methods for a Brain-Computer Interface driven by non-motor imagery tasks. Two non-motor imagery tasks were used, Auditory Imagery of a familiar tune and Spatial Navigation Imagery through a familiar environment. The aims of this study were to evaluate which method extracts features that could be best differentiated and determine which channels are best suited for classification. EEG activity from 18 electrodes over the temporal and parietal lobes of nineteen healthy subjects was recorded. The features used were autoregressive and reflection coefficients extracted using autoregressive modeling with several model orders and marginals of the wavelet spaces generated by the Discrete Wavelet Transform (DWT). An optimization algorithm with 4 and 6 taps filters and mother wavelets from the Daubechies family were used. The classification was performed for each single channel and for all possible combination of two channels using a Bayesian Classifier. The best classification results were found using the marginals of the Optimized DWT spaces for filters with 6 taps in a 2 channels classification basis. Classification using 2 channels was found to be significantly better than using 1 channel (p<<0.01). The marginals of the optimized DWT using 6 taps filters showed to be significantly better than the marginals of the Daubechies family and autoregressive coefficients. The influence of the combination of number of channels and feature extraction method over the classification results was not significant (p=0.97).